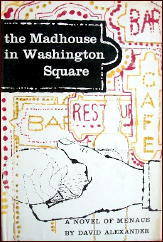 » A 1001 MIDNIGHTS Review: DAVID ALEXANDER – The Madhouse in Washington Square. A 1001 MIDNIGHTS Review: DAVID ALEXANDER – The Madhouse in Washington Square. 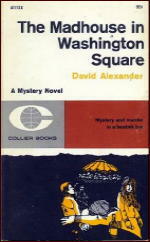 DAVID ALEXANDER – The Madhouse in Washington Square. J. B. Lippincott, hardcover, 1958. Collier 113, paperback, 1961. It is Cossack who finds failed writer Carley Dane beaten to death in Dane’s Greenwich Village cold-water flat. Any number of people had reason to kill the despicable writer, including most of the habitues of the Madhouse. Cossack doesn’t wish to see any of these people, his friends, behind bars. Besides, reporting the murder will interfere with preparations for his grand and compassionate scheme to blow up the tavern with one of his homemade bombs, thus putting its largely unhappy patrons — himself included — out of their collective misery. As Cossack’s scheme unfolds (and as circumstances force him to reluctantly assume the role of sleuth), Alexander introduces the reader to each habitue: Manley Ferguson, a frustrated artist; Helen Landers, a model who, when in her cups, suffers an overwhelming urge to do an impromptu striptease; wasted Peter Dotter, once rich and now a hopeless and pitiful alcoholic; Major Trevor, eighty-year-old veteran of the Boer War and World War 1, who supports himself by playing small character roles on the stage and on television; bitter old Martha Appleby, whose driving force for close to twenty years has been her hatred of Carley Dane. Other suspects include Bruno Madegliani, owner of the Madhouse, who loathes and mistrusts his customers and whose secret passion is to find the long-lost idol of his youth, a champion cyclist named the Great Goldoni; Penny Caldwell, a sensitive young poet who fancies herself another Emily Dickinson; and George Dabney Sturgis, a recently discharged soldier who came to New York just to meet Dane and received a rude welcome. Events set in motion in each of these characters’ lives during this crucial day are neatly resolved in the final pages; and Cossack reveals the identity of Dane’s murderer. As for his bomb … well, you’ll have to read the novel to find out whether or not the climax is literally an explosive one. In A Catalogue of Crime, Barzun and Taylor called The Madhouse in Washington Square “close to unreadable”; Barzun and Taylor obviously have no patience with eccentric prose styles and no empathy for eccentric characters. The fact is, the novel is not only readable but quite moving, owing in large part to David Alexander’s ability to sympathetically portray individuals whose lives and actions are far beyond the limits of rational human behavior. His treatment of these misfits is compassionate and gently humorous — and Madhouse is a kind of poignant tribute to all misfits, everywhere. 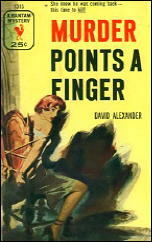 Alexander’s other non-series novels are Murder Points a Finger (1953) and Pennies from Hell (1960). The latter, a tale of menace and persecution reminiscent of Hugo’s Les Miserables, is particularly good. It is my personal experience that anything Barzun & Taylor deem to be “unreadable” ultimately turns to be quite readable. I haven’t read “Madhouse” but I’m pretty sure it is no exception to the rule. Back when I was using Barzun & Taylor extensively as a guide to decide what to read next, I found that if they liked a book, I would too. But if they didn’t, it was 50-50 whether I might like it anyway. Overall I imagine that that’s a pretty good average for a reader to find in a (pair of) reviewer(s). But I’m thinking now that I was lucky in deciding to read books they turned thumbs down on. They were fairly rigid (and consistent) in terms of what they were looking for in a book, no doubt about it, and if I’d stuck to only the books they liked, I’d have missed out on some very good ones. It was nominated for an Edgar in 1959 – the year when Ellin’s “The Eight Circle” won. With other nominees including Dorothy Salisbury Davis’ “A Gentleman Called” and Lee Blackstock’s “The Woman in the Woods” it must have been a tricky choice for voters. Thanks for this, Xavier. I didn’t know anything about the Edgar nomination. Good for him! I’m not surprised that Ellin’s book won, though. It’s a good one.